A study by Monash University’s Accident Research Centre has been undertaken to identify the risk factors for on-road cycling commuters, and while this sort of research is not new, the method employed is innovative – and gives unique insights into the ongoing battle for road space. Dubbed the “Naturalistic Cycling Study”, research was conducted using video recordings taken by having cyclists wear helmet-mounted cameras. The images captured cyclists’ perspectives of traffic behaviour, including the riders’ own head checks, reactions and manoeuvres. Participants each filmed 12 hours of commuter cycling trips over a four-week period. 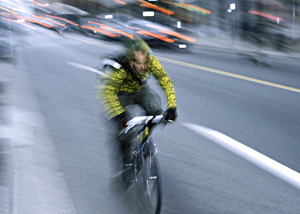 The research concluded that 89% of cyclists travelled in a safe/legal manner, that sideswipe was the most common incident (41%), and that most collision or near-collision incidents occurred at an intersection. The vehicle driver was judged to be at fault in most risky incidents (87%), and tellingly 83% of these events were observed to have no “post-event driver reaction”, such as braking or slowing. From the visual data, it was concluded that the observed frequent head checks captured in the videos suggested that cyclists overall had “high situational awareness” and that their reactive behaviour to driver action led to successful avoidance of collisions or near-collisions in most cases. There were more right head checks (57%) than left head checks (37%). The study’s methodology attempted to bridge the recognised limitations of the usual methods employed to find out the risk factors at play in bicycle collisions, that are typically generated by statements from drivers and witnesses, which can be subject to bias and memory error, or from crash scene investigations after the event, which cannot provide salient cyclist-related factors. It was found, for example, that only 57% of drivers actually indicated before they changed course, and of those that did indicate, 50% only did so for one-to-three seconds. Of the risky events recorded, and the 87% of these where the driver was determined to be at fault, the most frequent manoeuvre involved was turning left across the path of the cyclist. Observed 4WDs were more likely (85%) not to see the cyclist. Not that bicycle riders are squeaky clean as far as risk factors goes. The digital readout from trip computers, recorded in the videos as cyclists made frequent checks of their speed while riding, indicated occasional speeds of more than 40kph in traffic. The researchers concluded that such speeds would have a definite influence on a cyclist’s ability to successfully manoeuvre around obstacles or avoid collisions. The study was conducted as part of a doctoral research program by Marilyn Johnson, and funded by a joint scholarship from Monash University and the Amy Gillet Foundation. This story first appeared in Australian Cyclist magazine.